As I write this, I am very aware that it will be scrutinized and even criticized by those who may not be familiar with me or my heart. I can only pray that God will convey my true heart of compassion for people and the mission I have to share HIM with others. When I first saw the breaking news of the recent school shootings in Connecticut, I watched in shock as I burst into tears over all the innocent people who were massacred. With five grandchildren, I can only imagine the shock, the pain, and the hurt that the affected families have endured. My prayers and tears are with them today and in the future as well. Some will choose to correct me by saying “prayer” was kicked out, not God. Well, what is prayer? Prayer is communication with God. In any relationship, if you remove communication, separation will follow. When the governing courts removed prayer, they removed the God that students were praying to. Yes, a Christian can pray silently under their breath, but the overall message was, “public acknowledgement of God or reliance upon Him” is no longer welcome. God doesn’t want to be just a spectator “over” our life, but an active participant “in” our life. 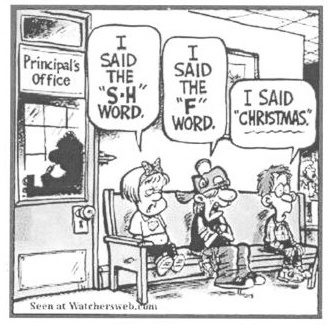 Nowadays though, everything from crosses, to the ten commandments, to the word “Christmas” are banned from many of the hallways and classrooms in our public schools. We have banned the Giver of life, the Savior of mankind, the Lover of our souls, the Shelter from the storms of life…..from an institution that has more time with our children than any other organization. In a society where there used to be a fear (respect) of God, we have now replaced it with a fear of offending someone. Political correctness has pushed Biblical holiness to the curb. Consider this. BEFORE 1962 (when prayer was removed) there was only ONE RECORDED killing incident at a public school…and it was with dynamite, not a gun. SINCE 1962 (when prayer was removed) there have been at least 63 school killing incidents, many with multiple deaths. And please don’t pull out the “gun control” card. The oldest surviving gun, made of bronze, has been dated to 1288. Guns have been ACCESSIBLE for more than 700 years, but ONLY USED IN PUBLIC SCHOOLS SINCE PRAYER WAS REMOVED IN 1962. Coincidence? No, consequence. Look, I’m no math major, but even I can do the math on that one. We have forbidden, restrained, and hindered our children from God long enough. I can only pray that our nation will embrace the love of God, and lead by example, so the next generation can experience “IN GOD WE TRUST” like our forefathers who began this nation. This entry was posted in The E-quip Devotion and tagged devotion, e-quip, guns, pastor kevin, PastorKevin, thenetrev. Bookmark the permalink. Your message is right on, Pastor. Sadly, most will still be blinded to the fact that the only problem we have is a sin problem! We have taken a land that was blessed by the hand of God and then removed all traces of him from our schools, our government, our land and even to some extent – our churches! We have watered down the gospel so that it doesn’t “offend” anyone. Who cares who it offends? It is the word of life! Jesus offended everyone and they killed him! We need to fight for the truth and to stand our ground for what is right. Everything else is going to perish. Change can never be made for the better unless we turn back to Christ. The word of God teaches us that in ending days evil will increase as the hearts of most grow cold. We are living in those times of prophecy. Only Christ can save us now. You are right on the mark, Kevin. Absolutely correct. Pastor Kevin I’m with you. Its time for a change for us to get into Gods word and follow His instructions. The churches need to join hands and make a stand. Our goverment has taken to much of our freedom away. My prayer is for you and the stand you take. Hey.wait.did you know that there were another 3500 kids murdered just today..but it didn’t make the headlines. Maybe those tools and devices that implement abortions should also be banned /outlawed. Our “fear” has been misplaced. We’ve gone from fearing God to fearing guns; from standing on His promises to standing on polital correctness. What do we expect? Until “ALL that is within us bless(es) His holy name” Psalm 103 and we “treasure God’s treasures” as Matt. 6 advises, we will get what we ask for. The path is not easy but, then, it never was. Amen! I believe that was well spoken. Sometimes, as Christians, we strive sooo hard to make the truth palatable to others that it gets diluted down and no longer is the “whole truth”. Christians need to take a stand for what is right in the sight of God and stop worrying about other people’s opinions. God bless you! Kevin, we also make schools gun free zones so only criminals will have guns. Good thinking! Getting God back into our country and leadership is the only hope for America.